You’ve made it this far, I suppose I should show you around. 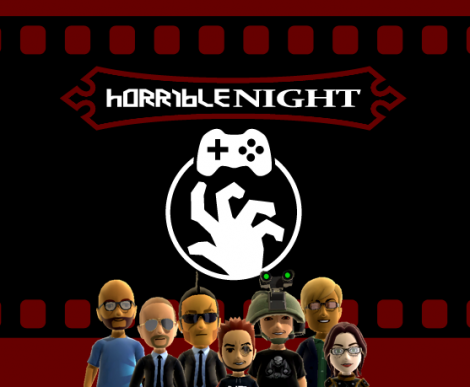 Horrible Night is the product of several gamers that just haven’t let it go yet. We fought it for a while, we were told we would grow out of it, yet here we are, our adult lives in full swing and we still find our minds wandering back to the video game industry. We keep playing them, we keep talking about them, we reminisce about them, and we still fight about them. We are here to present our biased opinions of the games we love, the games we are staying away from, and the games we remember. The only thing you can do in covering video games these days is to present your honest opinion. Let’s face it, the facts are out there, they are covered by everyone, but the bigger sites out there have grown too close to the industry itself. From that, we, The Cursed, have felt motivated to present our opinions as truthfully as possible. You don’t have to agree with all of us, but chances are you will agree with one of us. If not, hopefully we can expose you to another site out there that you can connect with. We all have a limited time and budget for games these days, we don’t like to waste our time with bad or boring games. We will play what we like, we will cover (in one way or another) what catches our attention, and we will dismiss everything else. Somewhere in there expect to find sparks for conversation, whether with us or your own Cursed crew. We have been working hard to get Horrible Night off the ground (shout out to Matt Brett who created this great WordPress template). We have a lot of ideas for how to make this community stand out, but wanted to get a site up that allows us to start producing worthwhile content and connect with other gamers. What you’ll find when you come to the site is our 3 featured articles that highlight the best of our recent updates. Up top you can connect with us on Facebook, YouTube, and Twitter, as well as subscribe to our articles feed. Along the sides you will see our Twitter feed of the entire Cursed writing staff. As well as, Shiny Objects which are links to daily game industry news and any quick reactions that we had while we were reading through. News will cover the headlines worth talking about, any editorials and industry commentary by our staff, as well as updated info of the latest happenings with the Horrible Night community. Previews cover anything we have seen but have not played the final version of. Look for trailers, reactions to game betas and demos, outside opinions when we witness someone else playing a game, as well as traditional previews based on the latest info available. Reviews come in a few different flavors, but rest assured these opinions only come after we have spent time playing the final version of a game. Traditional reviews are called Rated reviews that give the full breakdown of a game after we have completely played through it. However, we don’t always finish games these days, so sometimes a Reflex review will give our gut reaction to our initial session with a game. Retro reviews are looks back on the games we played years ago. Lastly, look for Recoil reviews in the near future as we take a second look at a game we recently finished after the dust has settled since we finished it. That’s enough to get you going. Let us know what you think by commenting, connect with us by checking out our profiles, or just show up online and blow us up. Don’t waste your time with bad games. Thanks. We are really excited to bring you original content as often as we can. Keep coming back and tell your friends.